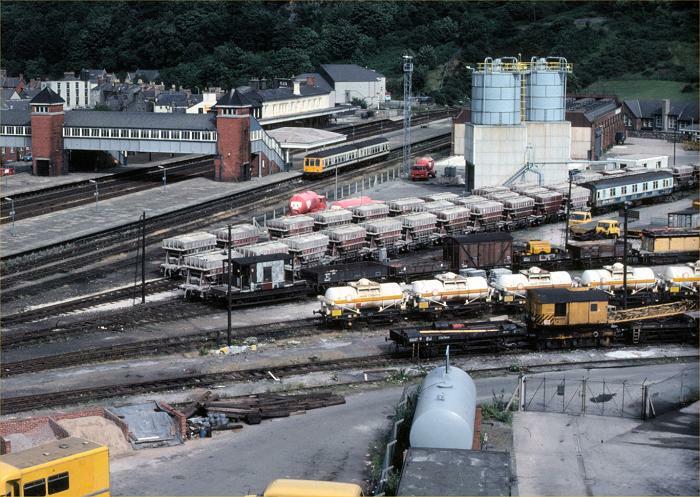 For July 1979 we are back on homeground, with this view of the yard at Bangor, taken on Saturday 21st July 1979. Every siding in the goods yard contains rolling stock. This remarkable sight was worth recording in 1979 - today it would be impossible to believe!. Firstly in the 'cement sidings', there are at least 34 Presflo wagons, which would have arrived carrying cement from the Tunnel Cement works at Penyffordd. Also present is a MkI sleeper - purpose unknown, but in departmental service. In the coal yard road are the wagons and specialised rolling stock of the Tunnel Maintenance train. The other coal line is empty, but its access is blocked by a rake of Liquid Chlorine wagons, awaiting a Monday morning trip to Amlwch. Finally, nearest the camera is another engineering train containing crane DM1419. The busy scene is completed by the Tunnel cement lorries which were based at the depot, and a 2-car DMU waiting in the old Platform 4 for its next working. The cement terminal provided traffic for the railway here from the mid 1970s onwards. It provided the raw material for several major civil engineering projects like the North Wales Expressway and Dinorwic Power Station. However, this eventually came to an end, and the silos have now been removed. The sidings, which predated the terminal, remain after it has gone.